Under The Moon, a brand new restaurant offering the finest cuisine and intimate private dining, is now open following 8 months of construction, announced Bill and Karen Hubel, owners. The restaurant is located directly beneath Blue Moon Grill, also owned by the Hubels, in Fulton’s Canal Landing. 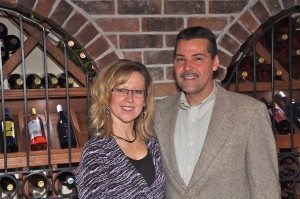 Karen and Bill Hubel, owners, Under The Moon and Blue Moon Grill. “There’s nothing like Under The Moon in our area,” Bill Hubel said. “This fabulous dining area and bar were designed to my personal specifications. We have used only the finest materials in the hands of expert craftsmen to create a classic, warm ambiance from Mahogany, granite, brick and wrought iron, that’s second to none. Under The Moon Bar Manager Ginger Alelunas pours a drink at the Mahogany and granite bar for Tara Bogoczyk at a recent wine tasting. Joining them are (from back to front): Curt and Catherine Vredenburg; Dan Carroll; and Jennifer Ruta. “Our guests will be swept away into another world of fine china, crisp linens, supreme cuisine and intimacy,” said Karen Hubel. “We will work with each client to tailor a menu, spirits, music, and superb service for their special gathering. According to the Hubels, events can range from a buffet to a sit-down dinner. Among the menu offerings are Lobster Stuffed Lobster, Seafood Risotto, New Zealand Lamb Rack, Filet Mignon, and more. Under The Moon, a brand new restaurant offering the finest cuisine and intimate private dining, is now open following 8 months of construction, announced Bill and Karen Hubel, owners. The restaurant is located directly beneath Blue Moon Grill in Fulton’s Canal Landing. 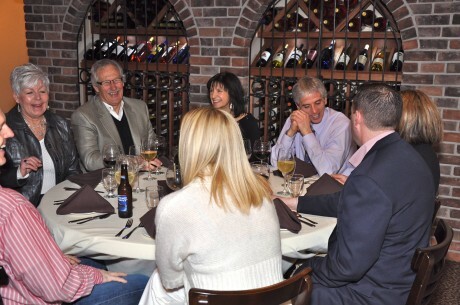 Here, guests enjoy a recent wine tasting in front of the restaurant’s dual wine vaults. From left, clockwise: Joe Baldwin (striped shirt); Jan and Tony Rebeor; Jennifer Ruta, Dan Carroll; Curt and Catherine Vredenburg; and Tara Bogaczyk. Under The Moon dining is available by appointment only. For booking information, contact Karen or Bill Hubel at (315) 598-4770. Under The Moon dining is available by appointment only. For booking information, contact Karen or Bill Hubel at (315) 598-4770.